So I’m a little late to the spaghetti taco bandwagon. Wait. What? You mean you’ve never heard of the delicacy known as spaghetti tacos? Where have you been?! It's spaghetti! It's a taco! It's a spaghetti taco! 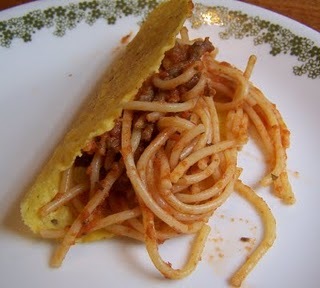 “It started as a gag: spaghetti tacos. But apparently the kiddie viewers didn’t get the joke. Instead, the paper reports kids began pestering their moms for spaghetti taco dinners. A quick Google search for “spaghetti taco recipe” yields 383 thousand hits. And there’s even a Facebook page with more than a thousand fans devoted to the dish. Now, I haven’t tried the dish, but I think that in addition to the under 5 feet tall fan set, spaghetti tacos will probably catch on with a certain group of adults who partake in certain recreational activities (if you catch my drift). This entry was posted on October 15, 2010 at 8:16 am and is filed under New Stuff to Try. You can follow any responses to this entry through the RSS 2.0 feed. You can leave a response, or trackback from your own site.